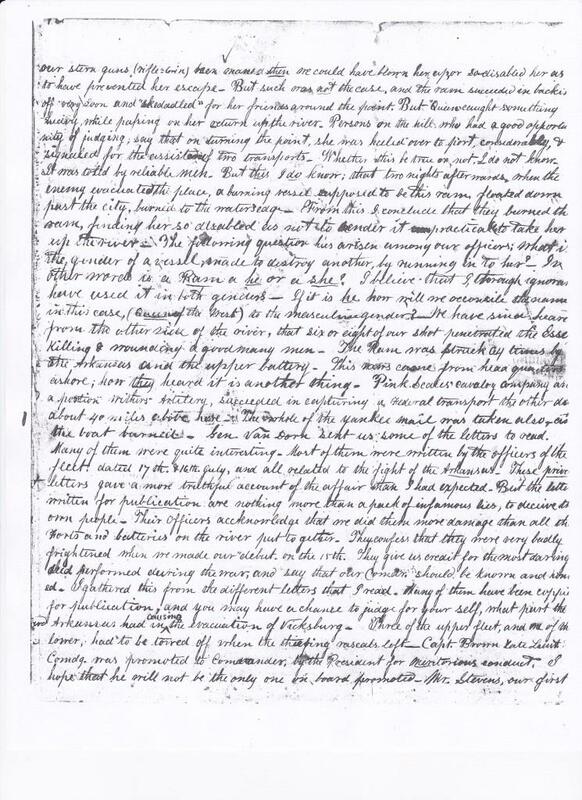 "The Wind of Cannon Balls"
Transcriptions are given below each of the original letters. For the most part, they are typed as seen. This letter by Dabney Minor Scales is of much interest to researchers. The sketch of the Arkansas, entitled "The Rebel Rascale," verifies the vertical sides of the boat's gunbox. Especially of interest is the mention of "about 600 yankee graves" seen on the Desoto peninsula, across the river from Vicksburg. The commanders of the Federal fleets mention burying their dead, but they are not specific concerning it. In later years the graves were probably moved to the new Vicksburg National Cemetery where Confederate water batteries had been located for the purpose of covering the approaching Federal boats rounding the point of Desoto peninsula to approach Vicksburg. learn the drills, when another green set comes, to give way to another in their turn. was the Essex, the Ram I believe, was the "Queen of the West." The Essex came first. signaled for the assistance of two transports_ Whether this be true or not I do not know. 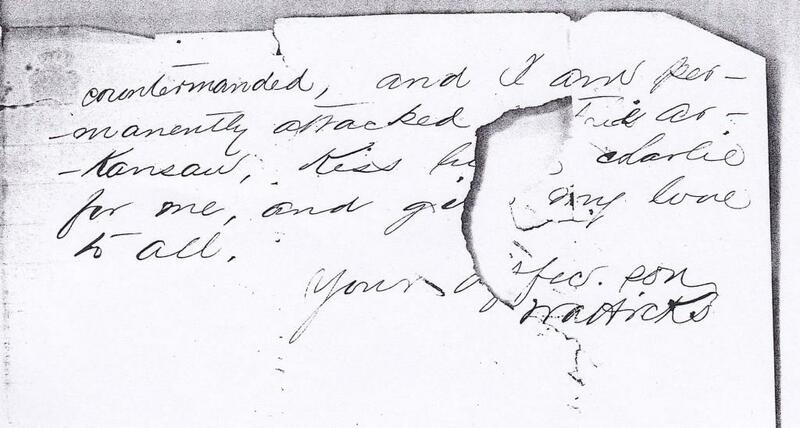 the boat burned_ Gen. van Dorn sent some of the letters to read. lower, had to be towed off when the thiefing rascals left_ capt. brown late lieut. without anything to eat, or any                            as she appeared after the fight. goodbye & write soon to your son. 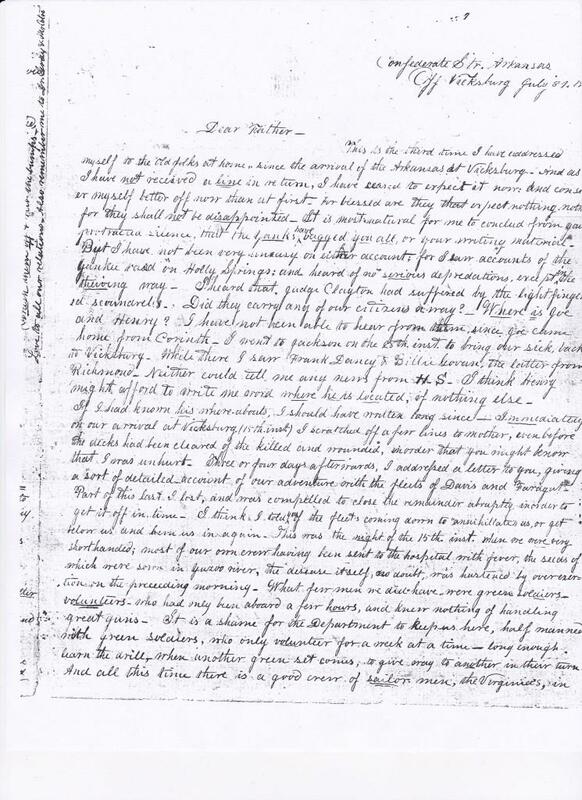 Two images from the letter follow. give you a rough sketch of the lay of the land around the city_"
Sketch by Lt. Dabney Minor Scales. "The rebel Rascal", St[eame]r Arkansas 10 guns. As she appeared after the fight." The materials to build the Arkansas were not plentiful. Because of the war, there was a severe shortage of pressed iron to use for cladding. The Arkansas was covered, instead, with T-rails from nearby railroads. The heavy machinery on the Capitol drilled the holes necessary for mounting. Note that Lt. Scales has sketched the protective layer of these iron rails horizontally on the side of the boat. The side of the gun box is vertical (not slanted). The front and back of the gun box are slanted, and the iron has been placed vertically. Most artwork of the Arkansas does not reflect this. 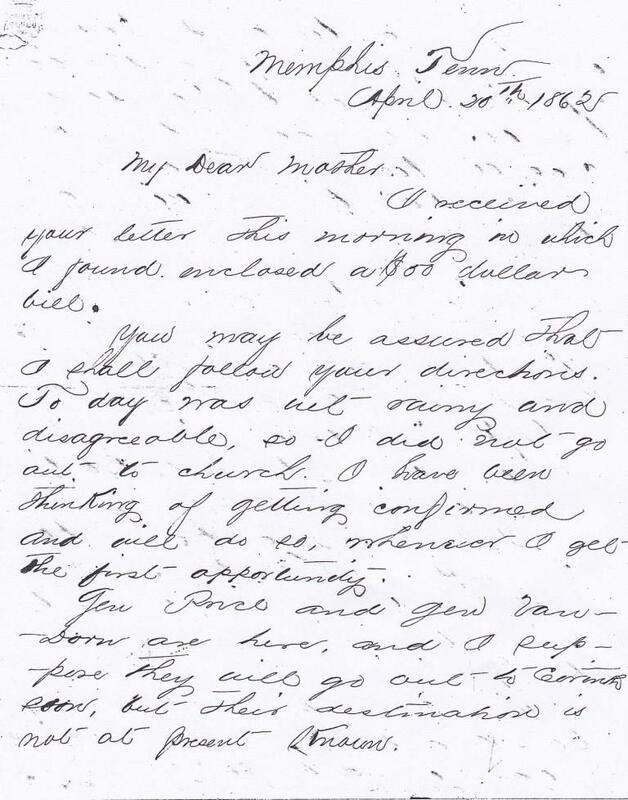 This letter is from William Alexander Hicks, CSN, assigned to the Arkansas, to his mother Mrs. Martha Hicks of Vicksburg. 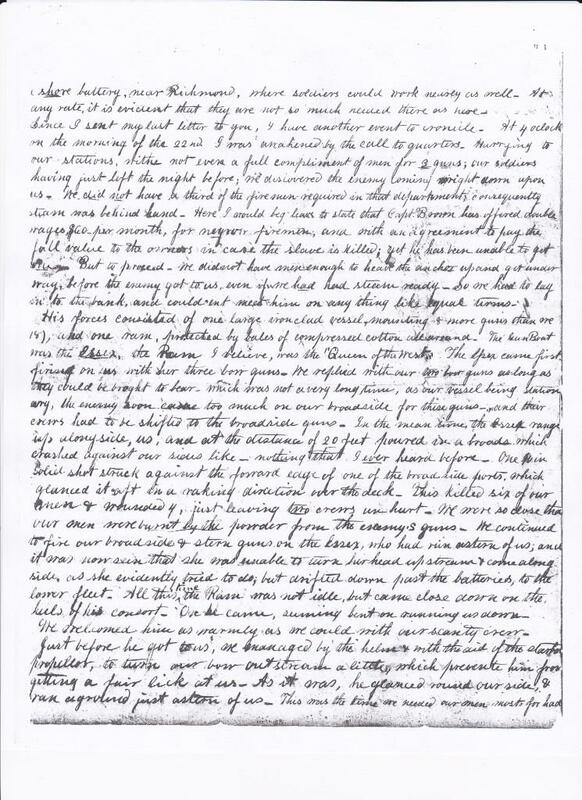 The letter is dated 20 April 1862. 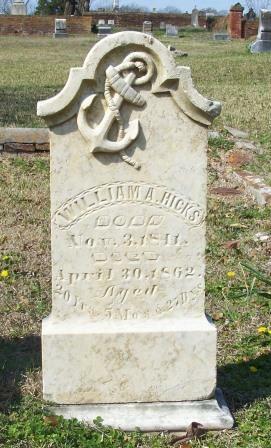 He died ten days later onboard the Capitol while assisting in completing the Arkansas in the Yazoo River. At the time of his death, the Arkansas was not active. He was buried in his family's lot in Vicksburg's Cedar Hill Cemetery. 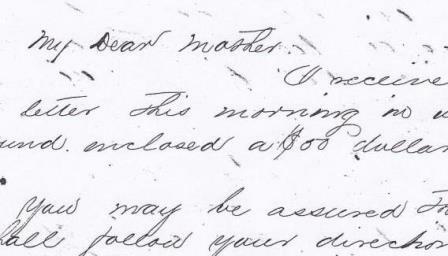 I received your letter this morning in which I found enclosed a $00 dollar bill. You may be assured that I shall follow your directions. To day was wet rainy and disagreeable, so I did not go out to church. I have been thinking of getting confirmed and will do so, whenever I get the first opportunity. Gen Price and Gen Van Dorn are here, and I suppose they will go out to Corinth soon, but their destination is not at present known. 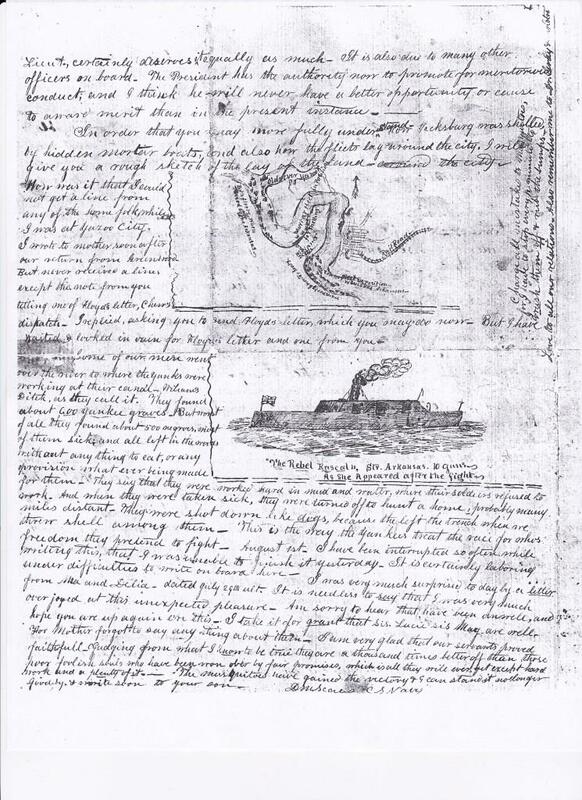 I stopped on board the Victoria when I first came up for three days, expecting to go up to Fort Pillow but was finally ordered to the iron clad gun boat ArKansaw. Since that time I will go to the steamer Capitol, where I shall probably remain, for at least eight or ten days. 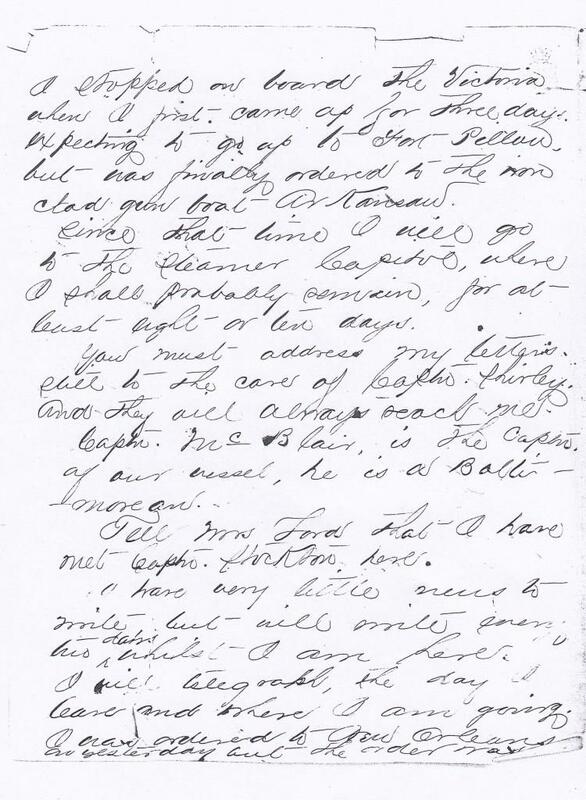 You must address my letters still to the care of Capt. Shirley and they all always reach me. Captn. McBlair is the captn. of our vessel, he is a Baltimorean. Tell Mrs Ford that I have met Captn. Stockton here. I have very little news to write but will write every day tho whilst I am here. I will telegraph the day I leave and where I am going. I was ordered to New Orleans on yesterday but the order was countermanded, and I am permanently attached [paper torn] ArKansaw. Kiss [little] Charlie for me, and give my love to all.